This is the first 6 feet of the original 15 foot long scarf. This version is offered for those that want a shorter version for more wearability. A six foot length scarf is a more standard length for a scarf. Instructions are included with yarn kit along with a spreadsheet of the colors and sizes of each stripe in inches and centimeters. This Scarf makes Great Gift!. The Kit Itself, is a Great Gift for any Beginning Knitter and lots of fun to knit for any Knitter. I've even had crocheter's use this yarn kit and follow the sizing directions of each stripe to crochet the scarf / scarves. This yarn kit was originally put together to teach Basic Knitting Techniques for Hand and Machine Knitters for Sharon Nani's Little Knitter Program. See the detailed step by step knit photo instructions for making the slip knot, casting on, knitting the garter stitch, binding off, finishing techniques of weaving in yarn ends, making tassels, steaming and hand pressing. These detailed instructions for basic Hand and machine knitting can be applied to any project and can be found on The Knit Tree's main web page in the Article: "Learn To Knit by Hand or Machine ~ Doctor Who Style Season 12 Scarf Replica Knit for Charity Challenge"
Click Here is see the article and follow all the links under Instructions to see the Basic Knitting Techniques ~ Read the whole article to follow the whole knitting experience of The Little Knitters and encourage Little Knitters of your own! 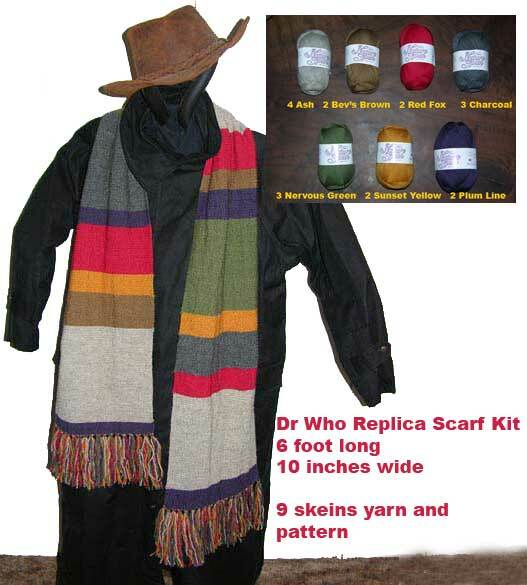 NOT INCLUDED: The Hand Knitting Needles. The recommended knitting size needles are 5 to 7, The sample scarf pictured was hand knit with Needle 7 to obtain a stitch gauge of 6 stitches per inch. It ends with a purple stripe, the pattern shows one more stripe in green for those that might be knitting a tighter row gauge. Submitted by gillcar on Fri, 03/25/2016 - 11:42. Received it this week and began knitting it. I love the colours and the wool that came in the kit. Submitted by Emailed in Review on Fri, 08/09/2013 - 21:08.